Bikers enjoy a ride on a Forest Service road south of Chadron. Strong Canyon trail is located across from Chadron State Park and offers connections to the Pine Ridge and Spotted Tail Trails. Strong Canyon Trail is a 5.3 mile loop south of Chadron. Bike riders in the Pine Ridge can enjoy a newly opened 13-mile section of trail on the former C&NW Railroad line between Rushville and Gordon. The Black Hills Overlook Trail is particularly recommended by several local riders and offers sweeping views of the prairies to the north as well as some challenging terrain. Some 30 years after a national biking magazine called Nebraska’s Pine Ridge one of the “best kept secrets” of mountain biking terrain in the United States, development of the area’s potential for the popular adventure sport is gaining momentum. The creation last year of the Northwest Nebraska Trails Association has given devoted local riders the opportunity to improve the trails they have been riding for years, and brought new riders into the area to explore the region’s diverse and rugged landscape and experience its natural beauty on two wheels. And a 100-mile race held last summer showcased for the first time another of the region’s little-known treasures for those who prize unusual outdoor experiences-cycling on the many miles of county maintained gravel roads in the area. National notice for mountain biking in the Pine Ridge came in the mid-1990s, when two writers from an organization called Bike America rode in the area on an assignment to rate mountain biking spots across the country, according to Herb Peterson, who operated the Ship Shape Bike and Barber Shop on Main Street for more than 20 years. “They didn’t rate it (the Pine Ridge), but they said it was one of the best kept secrets in the U.S.,” Peterson said. Peterson and his sons later helped make a movie about biking the area, brought in a nationally-known mountain biker, and helped map the area’s biking trails using GPS technology. He also guided groups of riders to show them what the area has to offer. “We had people from all over hell,” he said. A 1994 Trails Illustrated topographic map produced in 1994 with support from the Nebraska Tourism Commission featured more than 70 miles of the region’s biking trails, but the map has since gone out of print. The region’s trails may have failed to attract a larger audience because they aren’t what riders from other areas are used to, Peterson said. “It’s hard to rate. The trails here are not maintained, and are ‘non-trail’ to what people are used to,” he said. A group of local residents determined to take advantage of that potential formed the NNTA in 2017 with the goal of developing and promoting public non-motorized recreational trails in northwest Nebraska. One of the group’s first projects, in conjunction with the Dawes County Travel Board and a grant from the Nebraska Tourism Commission, was publication of the Northwest Nebraska Recreational Trails Guide, a pocket-sized booklet that includes maps of many biking trails in the region. The guide is available at the Dawes County Tourism/Chadron Chamber of Commerce office in Chadron and can be viewed online at www.discovernwnebraska.com. NNTA also schedules regular trail maintenance days and social bike/hike events in the summer months. Information about trail activities is available online at www.nwnebraskatrails.com or the NNTA Facebook page. For riders who aren’t ready for the ‘single track’ trails of the Pine Ridge back country, the sparsely traveled back roads around the region offer an easy and inexpensive way for cyclists to gain a different perspective on the scale and beauty of northwestern Nebraska. Riding on country roads provides opportunities for encounters with a variety of wildlife as well as stunning views of the prairies, buttes and wide-open skies. Although riding on gravel requires more pedal effort than riding on pavement, the multiple gears on most newer bikes make it easy to hit a comfortable pace, with plenty of time to watch for deer and antelope in nearby fields, hawks and eagles soaring overhead or even a bighorn sheep on a distant butte. For the really adventurous rider, the Pine Ridge National Forest and Grasslands are a great place to try bikepacking, a combination of long distance biking and camping. 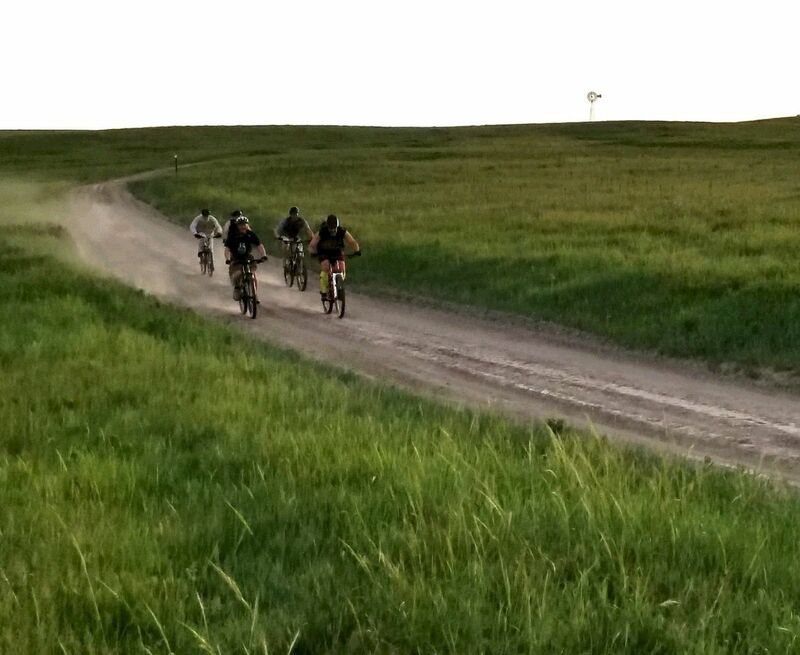 A recent article in Bikepacking magazine (www.bikepacking.com/routes/bikepacking-nebraska/) provides details on a 357-mile ride from Gering to Valentine, and is a testimonial to the incredible cycling opportunities of the Pine Ridge. “The Pine Ridge…provides a stunning landscape of sandstone buttes, ponderosa lined canyons and lung busting climbs,” said author Carl Gauger. There are also many riding opportunities for those who prefer to ride on paved roads and gentle terrain. Both the walking path on the Chadron State College campus and the road through Wilson Park in Chadron are easy to ride, with gentle climbs that are suitable for riders just getting in shape. A ride on the White River Trail, built on the former railroad line from Crawford to Fort Robinson State Park, offers another easily accessible option for beginning cyclists and beautiful views of Legend Buttes and the adjacent White River. Riders can also enjoy a newly opened 13-mile section of trail on the former C&NW Railroad line between Rushville and Gordon. That’s part of the Nebraska Game and Park’s Cowboy Nature and Recreation Trail, a 321-mile long rail-to-trail conversion that is one of 12 Gateway Trails included in the coast-to-coast Great American Trail project announced by the national Rails-to-Trails Conservancy earlier this year. The NNTA and Cowboy Trail West, another cycling oriented organization, were recently awarded grants to complete the trail segment from Rushville to Chadron, with work to begin in early 2020. Whether riding on gravel roads or back-country biking trails the requirements for equipment are nearly the same. A sturdy, multi-geared bike, with tires suitable for rough surface riding is a must, and front shock absorbers are highly recommended. Bikers should always wear a helmet, whether riding on streets, roads or trails. The prevalence of goat head thorn (also known as puncture vine) in the Pine Ridge creates another essential for riders-a treatment of ‘Slime’ or similar stop-leak product in the bike inner tubes. While not a guarantee against flats, putting some of the goop in your tires will reduce the chance that you have to stop to patch a leak. Even with the tire treatment, it is always wise to carry a patch kit and a pump while riding. A basic tool kit for simple repairs is also a good companion on a ride in rough country. Water is another basic for Pine Ridge riding. The exertion of cycling depletes the body of water, and even on cool days dehydration can quickly become a problem. Water bottle cages are a standard fixture on most bikes, and many riders opt for ‘Camelback’ style hydration packs that feature a plastic bladder inside a back-pack with a tube that feeds directly into the user’s mouth. Maps are an important asset when riding in back country. A large topographic map showing roads and some trails on federal land in Dawes and northern Sioux Counties is available from the Nebraska National Forest and Grasslands office, on north Main Street in Chadron. The Nebraska National Forest has also created a Motor Vehicle Use Map of U.S. Forest Service lands in northwest Nebraska. Although aimed primarily at ATV and motorcycle riders, many of those roads and trails are quite suitable for biking. The map is available at area gas stations, as well as from the Forest Service. Another small map of Pine Ridge Trails is available for free from the Nebraska Game and Parks Commission. It shows bike trails on both state and federal land, although not in great detail. It can be picked up at the offices of Chadron and Fort Robinson State Parks. For riding county roads, the Dawes County Travel Board has produced a map showing county roads of northwest Nebraska and details about some of the visitor attractions. It is free and available from the Chadron Chamber of Commerce and many local businesses. In addition to water most riders like to carry snacks of some kind. Granola bars, dried fruits and nuts are popular items and can help boost energy levels depleted by a hard climb or a prolonged encounter with the stiff winds of the Nebraska prairie. Depending on the season, a light jacket can also prove its worth if a storm arises while on the trail. Taking a cell phone along on your ride is also a good precaution. Although service may not be available in some areas, in the event of a major problem, it will almost always be possible to climb the nearest hill and get at least enough signal to call for help. Riders with smart phones can download free apps such as Strava and Map My Ride that will track and time your ride (or run or walk) and display it on a map. The apps can show your route on a satellite photo and display data on elevation gain, average speed and calories burned. As an extra precaution when planning a ride in back country, particularly if going solo, it is always a good idea to let someone else know where and when you are going, and about when you expect to return. Chadron State Park - One of the most accessible places for riding bikes in the Pine Ridge is Chadron State Park. The park’s paved loop road, about 3 miles long, has only minimal traffic and is very bike-friendly. There is also a network of mountain bike trails for varying ability levels; maps are available at the park office. The Black Hills Overlook Trail is particularly recommended by several local riders and offers sweeping views of the prairies to the north as well as some challenging terrain. Fort Robinson State Park - Crawford and Fort Robinson are linked by the four-mile long White River Trail along a former railroad grade. For the more adventurous, there are several trails leading from Smiley Canyon Road to Carter P. Johnson Lake or other parts of the park. Other trail options in the park are shown on free maps available at the office. The Cliffs - Located on the Nebraska National Forest, southeast of Chadron, the Cliffs area offers several opportunities for mountain bike riding. Trails go south as far as Table Road, with alternative routes for the return trip. To get to the Cliffs, go four miles east of Chadron and turn south on Bordeaux Road for about 7 miles to Forest Service Road 723. Spotted Tail Trail - Take Highway 385 south of Chadron for about five miles then turn east on King Canyon Road to the trailhead parking area. The Spotted Tail Trail goes through open meadows and stands of pine trees. The trail is well marked and can be ridden as a loop with a return connection on King Canyon Road, or a longer ride to Chadron State Park. Strong Canyon - Just across Highway 385 from Chadron State Park, a short gravel road leads north to the trailhead for this 5.3 mile loop, and offers connections to the Pine Ridge and Spotted Tail Trails. Coffee Mill Butte - Another jump-off point for multiple trail options. The trailhead is off Dead Horse Road, and the road itself can be used as part of a loop, with return via Table Road and FS Road 702. Parts of the area burned in 2012 so prepare for hillsides of blackened tree trunks in some places. Buttermilk loop - A 16.7 mile ride on county gravel roads and the state highway. From Chadron go south on Highway 385 and Old Country Club Road to Buttermilk Road, then east to Deadhorse Road and return via Highway 20. The route includes great views of the Pine Ridge and Crow Butte and crosses some Badlands terrain. Include a jaunt west on Hawthorne Road for a ride across the Dead Horse Creek drainage and a look at the distant Black Hills (on a clear day). Ormesher Road - An out-and-back ride from Chadron to the White River (about seven miles) on a less-traveled county road. Continue to the South Dakota border (about 17 miles from Chadron) if you have time, and plenty of water. Chadron Creek Wildlife Management Area - The Chadron Creek WMA is laced with trails created during the years the land was a privately owned ranch. Although its primary purpose is for wildlife habitat, cycling is allowed in the WMA. Connection to the Pine Ridge Trail on the Nebraska National Forest to the southwest is possible, which opens even more riding options. Take Camp Norwesca Road south from Chadron State Park to the trailhead.